What with Caribbean Pirates getting so much attention – followed closely in popularity by Barbary Corsairs and Madagascar renegades, west coast pirates seem largely forgotten. Personally, I can only name one pirate that frequented the Pacific Northwest, and that’s One-Eyed Willey from the Goonies (which may not have been entirely historically accurate, I fear.) As such, the chance to learn a little about this under-appreciated region was most welcome. “Pirates of the Oregon Coast” follows the exploits of a small ship and crew as they deal with local indians, Spanish authorities, and shipboard politics. The elements are present for a truly compelling read, but unfortunately the authors (five of them) seemed unable to commit to a single focus. In some respects, this book is historically-based fiction, featuring real places and feasible scenarios that might have served to illustrate likely historical truths. But in other respects it’s sheer fantasy, with magical jewels and sooth-saying birds, mystical glimpses of near and distant futures, and out-of-body experiences. These two extremes are interwoven in such a way as to make it difficult – if not impossible – to seperate the fact from the fiction, thereby dilluting this book’s potential as an educational vehicle. 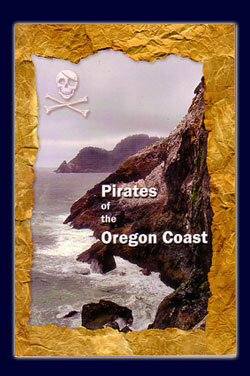 From the entertainment standpoint, Pirates of the Oregon Coast was adequate, albiet strained. The characters’ are presented in such a way that we feel we should care about them and share in their adventures, but they’re not fleshed out enough to allow us to actually do so. The story’s protagonist, Captain “Squint Eye” Jack, illustrates this underdeveloped nature best of all. Throughout the book he dupes his crew into helping him hunt for his indian lady-love with false promises of treasure and lost cities. His crew grows suspicious, but time and again Jack manages to quell their fears. But I found it difficult to share in his victories, as I was unsure whether to root for him or against him, as the drives and motivations of Jack and crew alike seemed surface level at best. The book leaves us wanting when it addresses the moral dilemas associated with quelling mutinies with lies, or of pursuing a noble end through less than legitimate means. These could be compelling and weighty issues, but require some amount of substance to grapple, which this book sadly lacks. Pirates of the Oregon Coast was a quick and somewhat enjoyable read. But primarily it only serves to highlight the vast untapped potential of the region is portrays. This entry was posted in Books and tagged benson, fiction, massahos, o'shaughnessy, seligman by Bilgemunky. Bookmark the permalink.